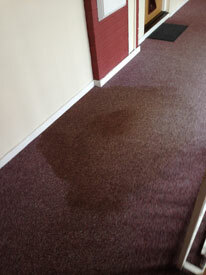 Do you worry about something staining your carpet? Is this because you are unsure of how you would deal with it? 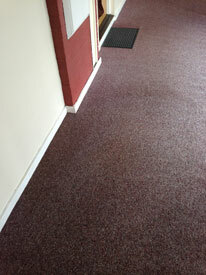 As part of our services we will always offer advice on how best to tackle carpet stains. We have put together a frequently asked questions page that goes through many of the regular questions we are asked, relating to carpet cleaning. It then goes onto discuss in depth stain advice with step-by-step procedures for different stains. This is all part of our comprehensive service; it is important that, with our help, you are left feeling like you are able to tackle individual stains in between our deep cleaning process. These pictures show a carpet cleaning job that we completed in Chalfont St Giles. This is a blood stain that needed removing. For this we usually advise to remove any excess and start by using a detergent solution, starting at the outer edge. The area needs to be blotted dry and this should be followed up with an Ammonia Solution and dried. The area should then be fully rinsed; visit our FAQ page for the exact process. The images show before, during and after the deep clean. 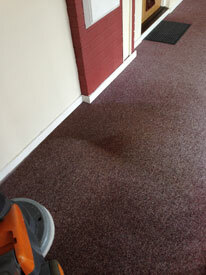 The stain was fully removed and the full carpet cleaned. This not only makes sure that the stain is removed but it leaves the entire carpet hygienically clean. Our industrial cleaning machinery works deep into the carpet fibres, making sure that every fibre is cleaned. This ensures that the stain does not reappear and there is no detergent residue left that would result in faster re-soiling. Our cleaning services are cost-effective and offer great value for money. If you would like to receive a quote for cleaning your carpets please call today on 0300 088 2188. Breathe life into your tired carpets as the transformations that we achieve are nothing short of incredible.